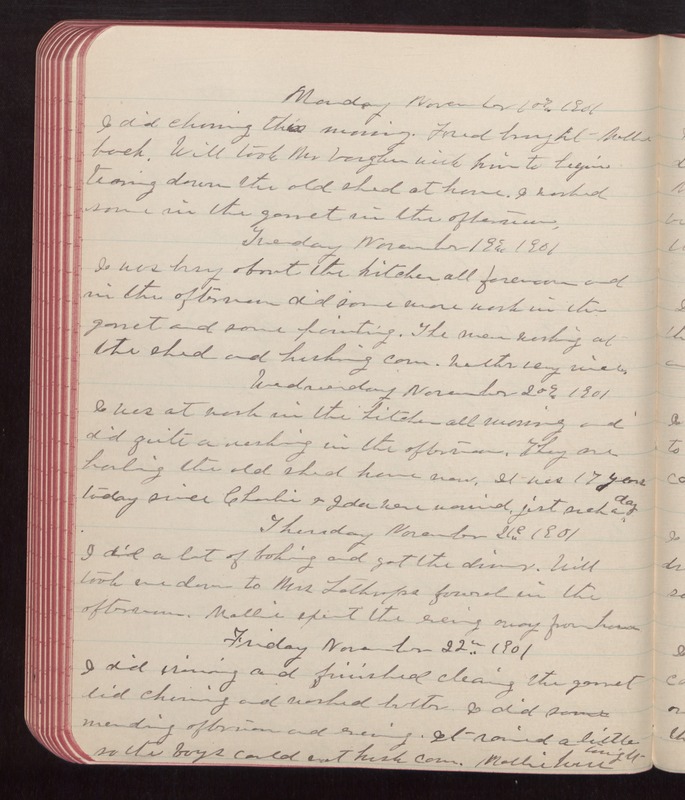 Monday November 18th 1901 I did churning this morning. Fred brought Mollie back. Will took Mr Vaughn with him to begin tearing down the old shed at home. I worked some in the garret in the afternoon. Tuesday November 19th 1901 I was busy about the kitchen all forenoon and in the afternoon did some more work in the garret and some painting. The men working at the shed and husking corn. weather very nice. Wednesday November 20th 1901 I was at work in the kitchen all morning and did quite a washing in the afternoon. They are hauling the old shed away now. It was 17 years today since Charlie and ida were married, jist such a day. Thursday November 21st 1901 I did a lot of baking and got the dinner. Will took me down to Mrs Lathrops funeral in the afternoon. Mollie spend the evening away from home. Friday November 22nd 1901 I did ironing and finished cleaning the garret did churning and worked butter. I did some mending afternoon and evening. It rained a little so the boys could not husk corn. Mollie here tonight.